Fluctuations in weight are a normal part of our day. You will usually notice you are 1 to 2 pounds heavier in the afternoon then when you first weighed yourself in the morning. This may be caused by a few factors such as water retention, increased intake of sodium in your diet, and if you have your period, you might also notice fluctuations in your weight. This includes working out and eating carbs, which will cause you to retain up to four times the amount of water consumed. Let’s break this down so you have a better understanding of each. At one time I remember writing a blog in which I explain the distribution of water in the body and organs. Each organ has a percentage of water that rests within it, inside and between the cells. Excess water in the body can cause you to appear swollen. This is medically recognized as dependent edema and can pool in the lower extremities, or the legs and ankles, or even the lungs. Any kind of swelling needs to be treated and should be addressed by a physician immediately. Also, any weight gain in excess of 3 pounds overnight should be immediately addressed by a physician. One way to manage sodium intake is to see how much of this mineral is stored in your canned goods, processed foods and dry goods. Consuming 1500 mg to 2300 mg of sodium a day is considered healthy, but there are things to consider. If you have a heart condition or kidney disease, your doctor might advise you consume very low amounts of sodium, or one at all. By the way, sodium and salt are not exactly interchangeable. Sodium is naturally occurring and is found in food items such as celery and milk. Salt is a combination of chloride and sodium. This combination is used to give food flavor or preserve food. Either one, sodium or salt, help absorb water in the body causing an increase in weight. Seriously ladies, do we even have to hit this topic? We all know how miserable we can be 3 to 4 days out of the month; and should we be so lucky, how about go on with our periods 6 or 7 days? We all know what a period is, but do we know what that bloody flow consists of? It is a combination of bloody and uterine tissue. 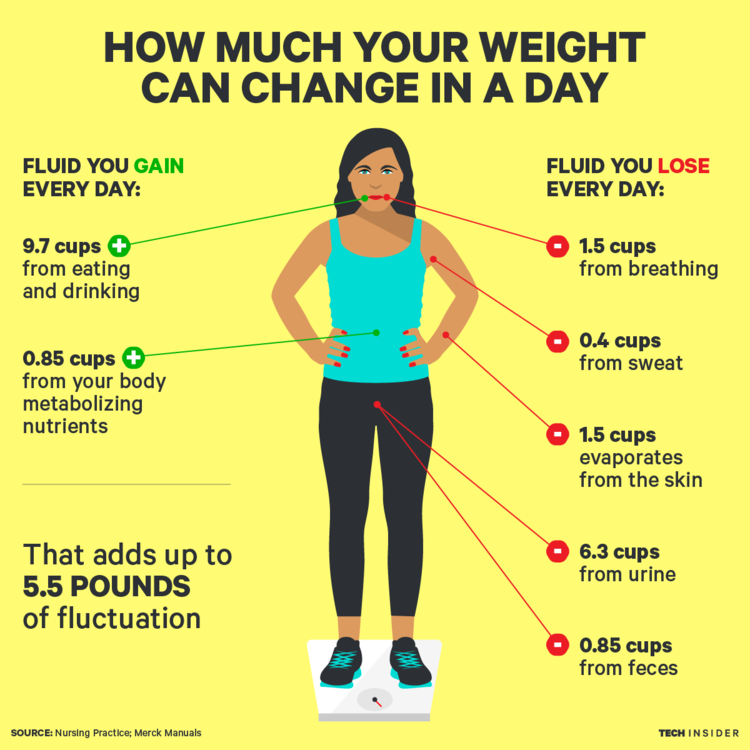 We lose fluids, we lose weight, right? Wrong. In this instance, we can blame the water retention on hormonal changes within our body. The decrease in estrogen and progesterone prepares the body for menstruation. These two hormones also play an important role in the body’s water regulation. It may also cause sensitive and puffy breasts, hands and feet; causing you to be a few pounds heavier in the morning or in the afternoon. During exercise you can lose a lot of water. This is very much dependent on how many layers of clothing you are wearing; how intense your workout is and how much you sweat during said workout. We all know exercise is probably the best way to manage weight issues. Don’t be alarmed though if you notice an increase in weight while your body shifts from fat loss to muscle building. You might plateau, notice weight loss, then gradually gain again while your body is developing healthy muscle tissues. Muscle weighs about 15% to 20% more than fat, is much denser, and displays very nicely. For every gram of carbohydrate you consume, your body retains about three grams of water in order to store the fuel source. For that reason, if you eat a very high carbohydrate meal, your body weight is likely to increase because of the water weight, not because of increased fat. – Malia Frey, verywellfit. Just remember that carbs equal sugar equals fat. If you let these carbs store away and don’t take advantage of this added energy to exercise, you will eventually gain fat weight. The important thing to remember here is that we are all built differently, need different levels of nutrition and water consumption. We also have different medical issues or none at all. In the end how we manage our diet and activity level will ultimately make a difference in the outcome of our overall health.